We started the new year off right with some travel. Because we hadn’t done that in a while (sarcasm). But in all seriousness, we were super excited to travel for this one. A friend of mine from grad school was married in November, and they had a delightful little party planned to celebrate the event during the first weekend of the new year. The bride LOVES blue, and it happens to be the groom’s favorite color, too. Prints weren’t preferred and symmetry was key for any sort of relaxation under this quilt. Most importantly, the bride has some serious pride for her state. She’s been transplanted from her beloved city, Cincinnati, for love, but her Buckeye blood runs deep (O-H—I-O deep in fact). I originally had planned a different quilt around these requirements, but when I came across the final pattern I knew I had to switch gears. 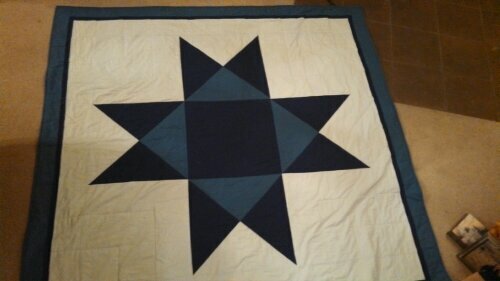 I had toyed around with the idea of using the traditional quilt square of the Ohio star, but I just couldn’t bring myself to do it. Any ideas I saw just kept look too country until it came to this one. The large scale quilt turned out to be the perfect size for cuddling, too (72in x72in). I made it very blue, with a simple geometric print (in blue of course) to spruce up the back. I started the quilt a little bit late at just two weeks before the reception due to other projects, but it came together so quickly. I put it in the washing machine at 8pm the day before we left and I was SO excited I would be able to wrap it up and deliver it in person. I’m still a little antsy about mailing these things! Well, we did get it there in time! We flew into Indianapolis, had a fun evening in Bloomington and headed to Cincinnati for the main event. We barely made it back to Bloomington on Sunday after hearing our flight had been cancelled due to a huge winter storm. The storm was so huge it kept us stranded in the midwest for an extra 4 days! I had two snow days for work and by that time I was a little sad that I had already gifted the quilt. It would have been perfect to cuddle under. Turns out the bride and groom thought so, too, given that they spent most of those days under it themselves!